The Chilkoot Pass was the main Canadian route to the Klondike. From 20,000 to 30,000 people crossed this pass during the gold rush of 1897-98. The North-West Mounted Police set up a check-point at the summit of the pass to collect duties and make sure that the prospectors had at least a year's supply of provisions before they were allowed to continue down the Yukon River. The pass was known and used as a trade route by the Chilkat, a division of the Tlingit nation. 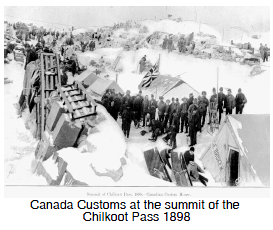 When a railway over the White Pass was completed in 1900, the Chilkoot route was less used. But it was revived in the 1960s as a hiking trail, called the "Trail of '98." The White Pass, at somewhat less elevation than the Chilkoot Pass (880 metres compared to 1067), was used as an alternate route to the Klondike, but because of its many hazards it wasn't widely used until the completion of a railway from Skagway to Whitehorse in 1900. A Country by Consent is a national history of Canada which studies the major political events that have shaped the country, presented in a cohesive, chronological narrative. Many of these main events are introduced by an audiovisual overview, enlivened by narration, sound effects and music. This was the first digital, multimedia history of Canada. It started out as a laserdisc in 1993 and the CD-ROM version has been used in schools across the country. It has been approved as a curriculum-supporting resource by provincial and territorial ministries of education. This online, public domain site is the fifth edition of the project.